Ricardo Saludo, former chairperson of the Civil Service Commission under President Gloria Arroyo, in his write up shared by a netizen on Facebook, spoke of the corruptions that occurred during the administration of Benigno Aquino III and of the continuance thereof in the form of his appointees still in power. "Today, the yellow hypocrisy continues, now decrying moves to hold its stalwarts and appointees accountable for gross anomalies. It has balked at impeachment petitions against Aquino appointees Chief Justice Maria Lourdes Sereno, Commission on Elections Chairman Andres Bautista, and Ombudsman Conchita Carpio-Morales." He said that the anomalies under Aquino were huge, even unprecedented in some respects, and are still burdening our people today. Saludo cited the problems in the transport department under Liberal Party stalwarts Mar Roxas and Jose Emilio Abaya where due to an illegal license plate contract bid out and awarded with no budget allocation, hundreds of thousands of vehicles have no license plates, even if owners already paid P400 each for the illegally contracted plates. He also mentioned the millions of unissued driver's licenses because the Land Transportation Office under Aquino’s shooting appointee Virginia Torres delayed payments on the computerized licensing contractor. He added that there was massive corruption in the Bureau of Customs, where smuggling trebled to $26.6 billion in 2014, from less than $8 billion five years before. He mentioned that more than 2,000 cargos were missing,but Aquino never had it investigated. 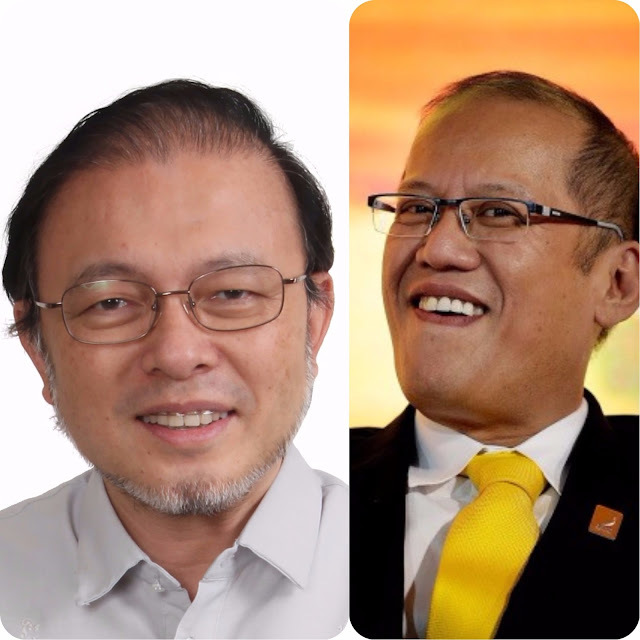 "Still, the most pernicious and anti-democratic sleaze was the use of pork barrel and the illegal Disbursement Acceleration Program (DAP) to induce legislators to pass Aquino’s pet bills and oust impeachable officials he didn’t like." The Priority Development Assistance Fund was created by Corazon Aquino and doubled from 8 billion during Arroyo's time, to 20 billion during Aquino's. He said that such corruption continues in the form of Aquino appointees still in position. "Is it now no longer right to impeach officials for not declaring tens or hundreds of millions of pesos in assets, like Sereno’s earnings from the NAIA Terminal 3 case, and most of Comelec Chair Bautista’s nearly P1 billion in bank deposits, as alleged by his estranged wife with passbooks and account statements?" he said,poiting out how the LP's unfailry impeached former Chief Justice Renato Corona for failing to declare dollar deposits covered by absolute secrecy, which he said was an offense that could have been corrected without penalty under the law. "So, why are they changing their tune now that their appointees are accused of hiding mountains of cash?" he said. He then spoke of incumbent Ombudsman Conchita Morales who he said, should be ousted for her loyalty to the past administration, as such was the fate of the Ombudsman before her appointed by Arroyo. "Consider what this wrongly awarded paragon of partiality has done. Despite a unanimous Supreme Court ruling that programs and projects not appearing in any pertinent budgetary laws were allocated DAP funds—a textbook case of malversation—she has found no reason to charge Aquino, who signed every DAP disbursement, and merely slapped the wrist of the other DAP author, former Budget Secretary Florencio Abad," he said. "In the disappearance of more than 2,000 cargo containers in 2011, she has exerted zero effort in probing the mammoth smuggling, even if it is so easy to simply grill all those who kept releasing boxes after dozens or hundreds had vanished, so they will point fingers at higher-ups who masterminded the scam," he added. He said that Aquino also invaded independent constitutional bodies by appointing his election lawyer Sixto Brillantes as Comelec chairman, his Ateneo classmate Sereno as Chief Justice, and the justice who swore him in as Ombudsman. "Plainly, if Chief Justice Sereno, Comelec Chair Bautista, and Ombudsman Morales, along with their yellow backers, were keen to keep their offices from falling under the sway of Duterte appointees, they should have kept their noses clean. But they didn’t," he said.